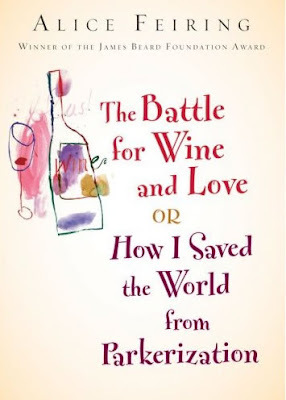 he full title of Alice Feiring’s book that I am reviewing today is, The Battle for Wine and Love Or How I Saved the World from Parkerization . Is it worth reading? Yes, it is. Most of you already know what Parkerization is, but for those who don’t, Wikipedia says it very succinctly: the widespread stylization of wines to please the taste of influential wine critic Robert M. Parker, Jr. To find out more, take a look at the Wikipedia entry for Robert M. Parker Jr.
What is this book about? It’s Ms. Feiring’s crusade against adulterated, manipulated, over-processed wines that have their sense of identity stripped by overzealous winemakers, largely in a quest to please the palate of Mr. Parker and thus bring more dollars into the winery’s till. Hey, I said that pretty good, didn’t I? 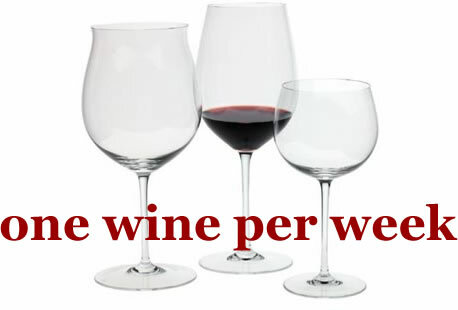 Feiring bemoans the increasing technology that is applied to wines. Rampant in California, it is now something she says is taking place on a global basis, sort of like those seed pods took over the earth in Invasion of the Body Snatchers. I envision the next remake of that movie to feature giant grapevines that replace the original vines with grapes that produce big, lush, overripe wines that have no sense of terroir. And Alice Feiring would play the role played by Kevin McCarthy, the one who discovers what is going on and tries to warn the world before it is too late. There are nine chapters in this book, starting out with how the author became infatuated with wine and then focusing on various aspects of how wine is becoming more and more over-manipulated. We are taken to various places in the world to share her adventures. The bad parts: I got the impression that Ms. Feiring carries not just a chip, but as Bruce Springsteen put it in Blinded By The Light, a boulder on her shoulder. Expect no subtlety here. She tries to come off as charming, amusing, cute and lovable and the David to Parker’s Goliath, but she seems full of spite and animosity. I also got tired of reading about her failed romances with Owl Man and Mr. Bow Tie and I don’t know what the point of all that was – to garner sympathy? She does not come off as a very sympathetic character as she tries to paint everything in black or white. Big = bad, small = good. Parker is the big bad man and it sounds like she is out to get him at every turn, making him to blame for every bad thing she finds about wine. It is the same rant I hear from people who are so anti-big business, as though every corporation in the world was some evil force just waiting to harm anyone in its path. She seems to pride herself on being a contrarian. In the book she is quite critical of the 2005 vintage in Burgundy; describing the reds during a tasting, she writes: “The fruit was intense. Too intense. I was perplexed.” In context, this would imply that she is suspicious of the wine being manipulated. Yet, from what I have heard, 2005 was an exceptional year for Burgundy, with growing conditions so ideal that little had to be done to the wines but let them develop naturally. The intense fruit reflects the conditions of the vintage. And isn’t that what Ms. Feiring is pleading for? Wine that reflects its true pedigree? I got the impression that rather than fight for wine that was a true reflection of its terroir and vintage, that she was more the contrarian, rallying for the underdogs that didn’t get the good reviews and blasting any high-scoring wine simply because Parker liked it. That said, the book does point out that there is indeed a lot going on behind the scenes to make wine fit a certain mold. It is good that we are made aware of it. The author’s sledgehammer methods, however, at times seem to resemble the same sledgehammer methods being used by the winemakers she accuses of engaging in Parkerization. Both are trying to use too much flash to sell their wares. Kermit Lynch had a similar message in his Adventures on the Wine Route but he didn’t sound like he was engaged in a vendetta. The feeling I get is that Mr. Lynch writes with passion about what he loves, whereas Ms. Feiring writes with a passion about what she hates; it’s a positive feeling in one book versus a negative in the other. After I am so critical, after most of this review is criticism rather than praise, I still say the book is worth reading? Emphatically yes. There are some interesting adventures within, and I do agree with her in principle, though Mr. Parker is not the villain she makes him out to be and the wine world is not simply black or white. I came away more educated and also with a frame of mind that was more critical of how “natural” the wine is that I now consume. Ms. Feiring also writes very well, making the book quite easy to read and understand. The subject matter was definitely something that needed to be addressed. I am thirstier now than before – and isn’t that something a wine book should achieve? Now as I do with wine reviews, below is a YouTube video that suits this book. If you can’t see the screen below, please click here. interesting review of the book. Because hereoff, i bought the book, and will now discover whats her crusade is about. Thanks for posting.